On Tuesday, May 1of this year I took an exciting trip to the zoo in Memphis, Tennessee. I saw all kindsof amazing animals that God designed. There were bears, lions, tigers, elephants, huge snakes and cheetahs, massive komodo dragons and bats, and scores of other interesting beasts. As I walked around looking at the animals and reading about their behavior on information boards, I was reminded of a couple of things. First, I was reminded of what an awesome God we have Who created all those different animals. Sadly, most zoos, including the one in Memphis, never give God any credit for His creation. In fact, many zoos and museums teach that evolution is responsible for all the different types of animals we see. 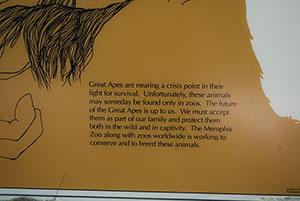 I was encouraged to see that most of the exhibits in the Memphis zoo don’t say anything about evolution. But it is unfortunate that the exhibits do not teach children that their loving heavenly Father designed and created the animals. Second, I was reminded that any time we go to a zoo or a museum, we must understand that not everything that is being taught is the truth. As I said, most of the animal exhibits at the zoo did not say anything about evolution, but a few of the exhibits did teach some things about evolution that are very wrong. For instance, the zoo had a captivating exhibit that displayed several kinds of apes. 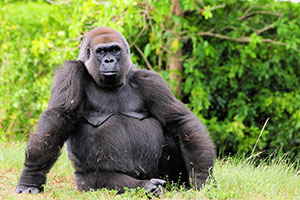 The massive gorillas sat lazily in the shade as the kids and parents snapped pictures of them with digital cameras and cell phones. In the middle of the exhibit was a large information board. The board presented several pictures of the different kinds of apes. It also presented the idea that apes are not just animals, but should be accepted into the human family. The information on the board is based on the idea that humans and apes evolved from a common ancestor. According to evolution, apes are distant cousins to humans. The people who wrote the information at the exhibit are trying to teach that humans and apes are relatives, in the same family, and that humans should protect their“cousins” just like they would protect other humans. The fact is, however, that humans and apes are not relatives. God made Adam from the dust of the ground on the sixth day of Creation. He made Eve from one of Adam’s ribs. In Genesis 3:20, the Bible says that “Adam called his wife’s name Eve, because she was the mother of all living.” She was not the mother of any living ape, dog, or sheep. She was the mother of all living humans. Every human ever born descended from Eve. Humans did not evolve from ape-like creatures, and apes are not our relatives. When God created Adam and Eve, the Bible says that He gave them “dominion” over all the creatures on the Earth. That means they could control the animals and use them to do work and other things. In Genesis 9:3, God told Noah and his family that all the animals, “every moving thing,” could be used as food to keep Noah and his descendants alive. Humans and animals are very different. Humans have souls and animals do not. Humans use animals for food, like beef from cows and ham from pigs, but we do not use other humans for food. Nor would we put other innocent humans in a cage against their will to be exhibited at the zoo. But there is nothing wrong with putting animals in a cage to be exhibited at the zoo, since humans have dominion over the animals. God designed humans in His own image (Genesis 1:26). He sent His Son to die for the sins of humans, so that their souls could be saved. God did not send His Son to die for animals, because they do not have souls and they cannot sin. No animals—not even apes—should ever be viewed as part of the human family.